It is rightly said that, “Success is a measurement of your own satisfactions rather than the satisfaction of others”. In today’s fast growing economies, start ups have their own stories, some of which are a huge success. One such success story is that of Zivame – the online lingerie store. And the success story of Zivame is the success story of Richa Kar. If you have ever ordered your lingerie online, you must be aware of the name of Zivame – the first ever online lingerie portal in India. Richa Kar’s name is synonymous to Zivame as she is the co- founder of this hottest selling brand in India. Richa Kar is one of the most famous names in the online shopping business. 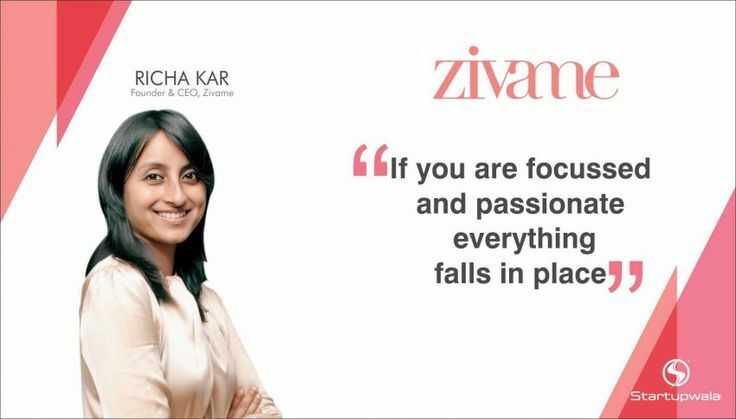 Richa Kar, the founder and CEO of Zivame, is one of the youngest and most successful entrepreneurs of India. She grew up in humble backgrounds like you and me. Richa Kar was born on 17th July 1980 in Jamshedpur, Jharkhand. She belongs to a middle class family with humble backgrounds. Her father was an employee at Tata Steel while her mother was a homemaker. The family set up was conventional with no business role model to look up to. Richa graduated from BITS, Pilani in 2002 with a B.E degree in Civil Engineering. She worked as a Software Analyst for a year (2002-2003) and then as an IT Consultant with i-flex solutions for another year (2003-2004). In 2005, Richa pursued her MBA from SKVM’s Narsee Monjee Institue of Management Studies (NMIMS). She completed her MBA in 2007 and then moved on to work with Spencer’s as their Brand Communications Manager. A year later, Richa was promoted as an Area Manager in Spencer’s. In 2010, Richa got an opportunity with SAP to work as a Consultant – Business Process (Retail). Here at SAP, Richa got an opportunity to work for the lingerie company- Victoria’s Secret. It is at SAP, that she studied the lingerie market, business models and the market structure along with leadership. Soon, Richa realized the social discomfort around the lingerie shopping in India. While working with SAP, she was surprised to find that a quarter of the sales of Victoria’s Secret came from their online channel. Lingerie as a category was never thought of in India. It was the most neglected part of a woman’s wardrobe. Richa then did her ground work. She actually visited departmental stores, and even met all the brands to understand the entire landscape of lingerie market. All this research made Richa realize the need to start a lingerie online store that could provide the privacy as well as a wide range of products in different sizes to suit the requirement of Indian women, at their door step. To resolve the issue, Richa worked on an online model for lingerie shopping in India and hence was born Zivame. Zivame was named from the Herbrew word Ziva meaning radiance. Richa added me to the word Ziva giving birth to ZIVAME. Zivame was conceptualized in July 2011 from a tiny office space in Bangalore for which Richa had to borrow Rs 30 Lacs from her friends and family. Richa, Co-founded Zivame with Kapil Karekar. I chose E-commerce as a channel to solve the problem of poor availability of inner wear in India. And therefore, lingerie and hence Zivame. Being able to fulfill a certain need is most gratifying.” “It’s gratifying but it’s never easy. ALSO READ Priyanka Chopra revealed 12 Rules behind her Success! But Richa was prepared to take challenges head on. While working with Spencers and SAP, Richa had gained a valuable retail experience that she carried on with her to her start up Zivame. As the company grew, they raised funds from leading VCs. Within a span of three years, Zivame had grown from a small operation to a team of more than 200 members. Today Zivame is the most visited online store, realizing 5 million visitors with 1 million unique visitors, featuring more than 5000 styles, 50 brands, and 100 sizes with a valuation of $100 million. I guess conviction in one’s belief is the greatest driver. Next challenge after the conception of Zivame was the flow of cash. Richa Kar took some concrete steps to ensure the funding of Zivame. She met Vani Kola, founder of IndoUS Venture partners and generating VCs (risk capital) became a thing of the past. Richa Kar faced a major challenge in the financial year 2015-16. By this time Zivame had reported an 84% increase in the net losses which stood at Rs54 Crore in FY16. Richa stepped down as the CEO of Zivame but continues to be in the board. She continues to provide support to the organization in every possible way. In an interview with YourStory, Richa revealed her perspective on entrepreneurs. Men entrepreneurs and women entrepreneurs are one and the same as both genders need to work hard. The challenges and advantages are same for both. This idea of Richa about not having the need to differentiate entrepreneurs on their gender is tremendously appealing in today’s world. It inspires many more women to shed their inhibitions and have courage to become entrepreneurs. If you are strong, focused and passionate about what you want to do, everything falls in place. So this is how everything fell in place for Richa Kar. I hope that you all would feel not only inspired but triggered to take that dream of yours to the realization levels. Richa Kar indeed has grown out of humble backgrounds to touch the skies. The path she chose was of course was the unbeaten track. So don’t feel a bit embarrassed of your peculiar choices, give your dreams your voices.